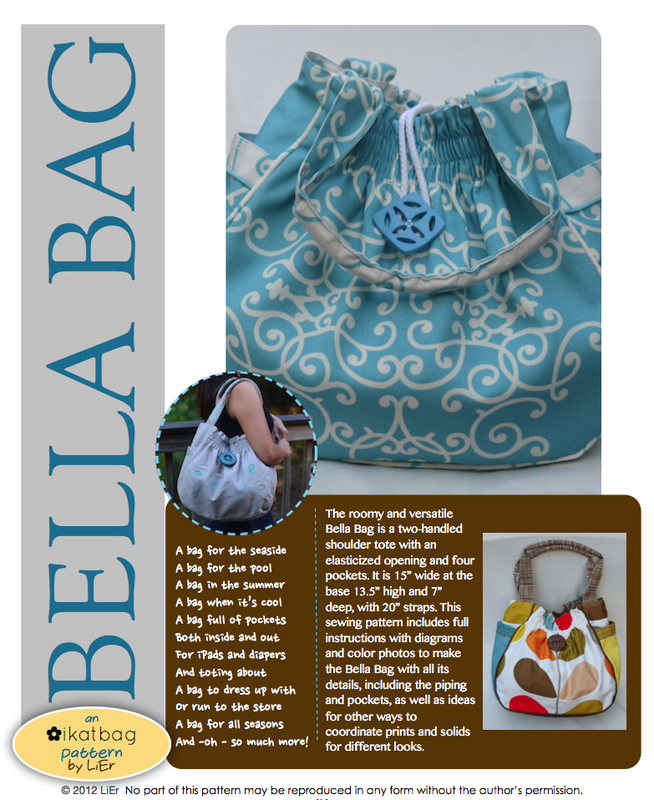 This is a pdf sewing pattern to make the Bella Bag. The Bella Bag is a roomy, stylish tote with an elasticized opening and four pockets. It is 15" wide at its base, 13.5" high and 7" deep, with 20" tubing-reinforced straps. The four pockets include two side patch pockets, one external lapped zippered pocket and one internal zippered welt pocket. Intended for the intermediate seamstress, this pattern includes detailed instructions for attaching zippers, constructing pockets and making and attaching piping. No special sewing equipment is required, except for a sewing machine with a regular presser foot and a zipper foot (a piping foot is not needed). The pattern has almost 70 full-color instructional photographs and 12 hand-drawn illustrations in 36 pages. These pages include 1 cover page, 4 pages of full-size templates and 31 pages of instruction. In addition to the templates, dimensions and detailed instructions are provided to enable users to cut out the remaining pieces (simple rectangles). Included in the instructions are suggestions for alternative materials and variations to the design using multiple fabrics.